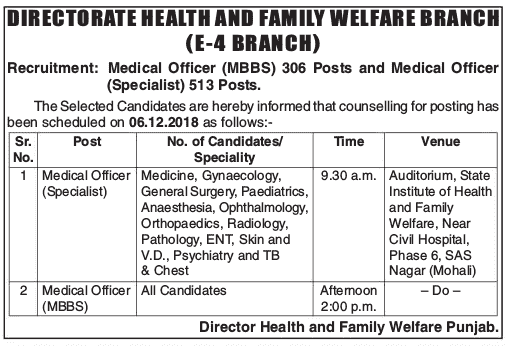 Directorate Health and Family Welfare Branch (DHFWS), Punjab has recently advertised a notification for the recruitment of 306 Medical Officer (MBBS) and 513 Medical Officer (Specialist) posts. The department has updated the DHFWS Punjab Counselling Schedule for these vacancies on 06.12.2018. The candidates who have applied for the DHFW Punjab Recruitment 2018 for these vacancies can now attend the counseling on the due date. Thousands of candidates applied for this recruitment. Now they are looking for the counseling dates for the Medical Officer jobs. Now here we are going to provide you the details about this. You can now attend the Health Department Punjab Counseling 2018 for the MO posts. Important Note: Kindly bring all of your original documents at the time of counseling.